Dr. Johnson may have been correct in saying that "Rousseau was a very bad man," but none can argue that his ideas are among the most influential in all of world history. It was Rousseau, the father of the romantic movement, who was responsible for introducing at least two modern day thoughts that pervade academia: (1) free expression of the creative spirit is more important than strict adhesion to formal rules and traditional procedures, and (2) man is innately good but is corrupted by society and civilization. 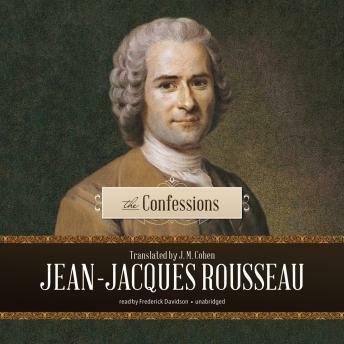 The Confessions is Rousseau's landmark autobiography. Both brilliant and flawed, it is nonetheless beautifully written and remains one of the most moving human documents in all of literature. In this work, Rousseau "frankly and sincerely" settles accounts with himself in an effort to project his "true" image to the world. In so doing he reveals the details of a man who paid little regard to accepted morality and social conventions.